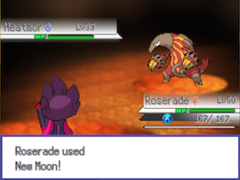 New Moon is a weather condition introduced in battle exclusively in Pokémon Insurgence. It will last for five turns if created using Noctem or New Moon, or eight if created while holding a Dark Rock. New Moon used "The sky faded to pitch-black!" 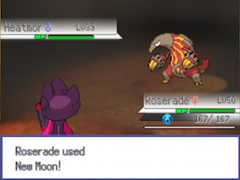 Noctem activated <Pokémon>'s Noctem darkened the sky! After turn is complete "The sky is dark." When New Moon ends "The sky brightened again." New Moon does not occur naturally in any available locations as of 1.1. Allows Lunar Cannon, Phantom Force, and Shadow Force to be used instantly. Reduces the healing of Synthesis and Morning Sun by 66%. Reduces the healing of Moonlight by 50%. Reduces the power of the move Freeze Shock by 70%. Reduces the power of the move Surf by 50%. The effects of Hone Claws are increased from 1 to 2 stages. This page was last edited on 26 July 2018, at 00:52.